Since our inception, Van Buren Telephone Company, Inc. (VBT) has evolved from providing party-line phone service, to being a full-service provider of the most advanced phone, long distance, high speed Internet and wireless phone services available. As a part of a state-wide fiber network, VBT customers have access to cutting-edge technologies and top quality services. Plus, as a local company, we are proud to support the communities we serve. 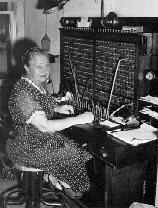 Van Buren Telephone Company truly is where technology meets tradition.